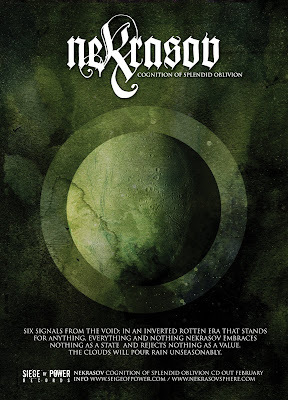 HSS: Nekrasov, "Cognition of Splendid Oblivion"
Nekrasov, "Cognition of Splendid Oblivion"
The latest from HSS favorite Nekrasov. You can get it from Siege of Power. The preview track on the Nekrasov myspace page is uncompromisingly brutal and flat-out incredible. It sounds like the man has really outdone himself, and that's saying quite a bit if you ask me.